A cleaning checklist for kids’ rooms empowers your children to take responsibility for their space while helping them learn valuable life skills. This particular cleaning checklist was born out of countless arguments I had with my children over whether their rooms had really been cleaned. You know how those go: you ask them to clean their rooms. After a while, they say they’re finished, but it looks just as bad — if not worse. In my home, that used to lead to frustration all around. I’d shown my kids repeatedly how to clean things, and I didn’t want to have to watch them every second. They knew that cleaning their rooms was part of earning their allowance, but felt like they didn’t know where to begin. If you’ve used my printable cleaning checklists around the house, you know they break tough cleaning tasks into manageable steps. 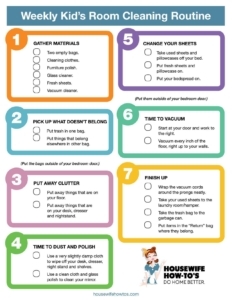 That’s the kind of structure kids need when cleaning, too, so I decided to come up with a printable cleaning checklist for kids rooms to make things easier for everyone involved. Here’s the deal: you can’t just hand your child a cleaning checklist and expect them to get it right the first time. Guess how I know? Yep, our first attempt at using a cleaning checklist for kids rooms led to more frustration. Then I listened to what my kids were saying. They were willing to clean their rooms (especially if that kept me out of their space) but they didn’t understand what was involved. So, my advice is to go over the instructions below with your child step-by-step, then tackle the task together the first time as we did. 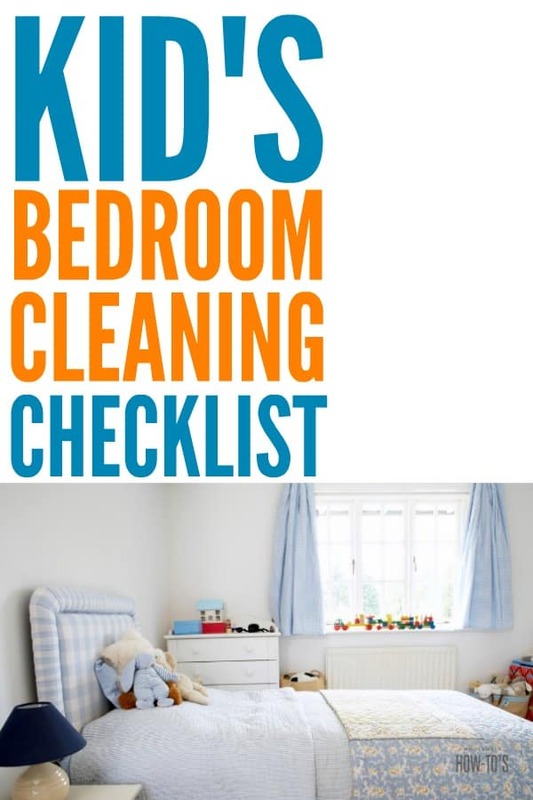 After that, depending on your kids’ ages, they can use the checklist to clean their rooms independently while you do something else — or even nothing at all. 2. Pick up all trash: Start at the door and work to your right. Pick up all trash and put it in the “Trash” bag/box. Open drawers as you work and look for trash that should be thrown away. Close each drawer afterward. Once you’ve worked your way around the room, look under your bed and gather all trash. Look in your closet for trash, too. Now, set the full bag outside your bedroom door. 3. Find everything that belongs in another room. Do this just as you did with the trash, starting at the door and working toward the right, then under your bed and in your closet. Things that belong elsewhere include dishes, water glasses, and towels. Put these in the bag marked “Return.” When you’re finished gathering these things, put this bag outside your bedroom door, too. 4. Put away things that are on the floor. Toys left on the floor look messy. Put them in the toy box, on shelves, or wherever they are supposed to be stored. Pick up dirty clothes from the floor and put them in the hamper. Clean clothes should be hung up or folded and put away in the dresser. Shoes should be neatly placed on the closet floor. 5. Put away the things on your desk, dresser and nightstand. Put away toys left on the dresser. If you like to keep homework or books out where you can find them, arrange them in stacks. Things look much cleaner when stacked nicely instead of sprawled all over. Continue working until all of the flat surfaces in your room are neat and tidy. 6. Start dusting. Get one cleaning cloth very lightly wet. It should not be dripping water everywhere! Use this cloth to clean up dust. Start at the room’s door room and work to the right wiping off the top of each piece of furniture (desk, dresser, shelves, nightstand, etc.). Pick things up as you work and wipe the surface underneath them. Wipe the windowsills, too! 7. Clean the glass. Spray the mirror with a little of the glass cleaner. Use a dry, fresh cleaning cloth to wipe the mirror from top to bottom until all smudges and streaks are gone. 8. Change the sheets. Pull the bedspread and sheets off of your bed. Don’t pull off the mattress pad! Take the pillowcase off the pillow. Now, put the new sheets and pillowcase on and make your bed. Smooth the bedspread with your hands so it’s not bunched up and messy. Put the dirty sheets outside your bedroom door. 9. Start vacuuming. By now there should be nothing on the floor that doesn’t belong there, so it’s time to vacuum. Remember: never use the vacuum to pick up coins, puzzle pieces, Lego or other objects. It’s only for dirt, dust and pet hair. Begin vacuuming at the door and work your way around your room from right to left. 10. Time to finish up! Wrap the vacuum’s electric cord back on the prongs neatly. Put it outside of the door. Take dirty sheets to the laundry room. Take the Trash bag to the garbage can. Go through the bag marked “Return” and take each item to the place where it ought to go. Don’t just toss the thing in there — put it where it belongs! The first time may seem like a lot of work, but things will go much faster every time you clean. Use the checklist below once a week to stay on track and enjoy that tidy room! From what age should a child be able to do this? I have 6 year old twins and a 4 year old (and a new baby on the way). One of the twins is very messy and the other very organised. They share a room….if I asked them to do this one would contribute a lot more than the other!?! Is 6 too young? At the moment they are responsible for tidying up their clothes/toys, packing away folded washing and occasionally they make their beds in the morning!! First off, wow, being a mom of twins has got to be hard! I’m not a twin mom — I had a few years between kids — so I can’t honestly give you advice on the whole twinning thing. But I have had two six-year-olds (even if there was a gap between them) and mine were completely different in temperaments and cleanliness. I initially created this checklist for my oldest when she was 8, and she was the tidy one. My youngest didn’t start following it without supervision until he was 10. That said, you might want just to spend some time working together with BOTH of them to go through this. Weekly? Maybe not. That’s asking a lot out of a mom who’s already doing so much just managing twins. Monthly seems fair — but let THEM choose who does vacuuming, who does dusting, etc. Good luck to you, Nicole, and please check back in with future questions or to update us on your progress! We are lucky because my kids have fairly small rooms and after decluttering, a lot less stuff. But I do have to get onto teaching them how to dust, change sheets and vacuum though. This checklist is a great way to do that! This really helped.Do you have any for a bathroom or living room. I have an entire page of cleaning checklists! I think cleaning the kids room is the most stressful. I start feeling sorry for them so I go to help and….. well….. I started to noticing that I would be all alone cleaning while they either sat in one corner playing or day dreaming. My 8 year old likes to pick up a tiny piece of paper and take 10 min to carry it to the trash can and that’s with me having a trash bag in there. They start taking advantage of me. To the point of being very disrespectful, see me sweeping drop crumbs on the floor or throw trash down and say here’s some more. Mopping walk all over the wet Floor and “accidentally” spill something. Just the other day I had cleaned their room while they were in school I mean really good. Thought I’d surprise them. Folded clothes put ones that gang up on hanger pj’s folded in a pile underwear socks in a pile you know made piles of where each drawer they went into no confusion no Hassel, open pj drawer put the stack in move to next stack etc. Later that night I open closet door the 8 yr old had took all the clothes and threw them into the closet!?. I was infuriated because when asked why he would do that he says you cleaned everything else you should’ve finished it. I wanted to do what I wanted to do. Besides cleaning is your job. At that point I emptied every drawer in the floor as well as every toy box and said it will be waiting on you when you get home t9morrow from school. So I’m going to try this routine out. I get overwhelmed with 3 kids and having to do all the house duties. 8, 5, and 2 so it’s mess after mess. Never ends I’m always behind. Cleaning kids’ rooms is definitely stressful for the parents. Add to that the way your son treated you and, yes, I completely sympathize with your frustration. And you DO sound frustrated! I’m reluctant to give parenting advice when someone didn’t ask for it, but maybe it’s time to take a break from trying to surprise your son since he’s not grateful for or appreciative of your efforts? Hand him a checklist, tell him that cleaning his room is his responsibility now, but you expect it to be done and done correctly. You should decide what consequences you want to attach to a room that’s not cleaned properly and be prepared to stick to your guns. Kids test limits — that’s kind of their job. Once they understand the limits are firm and consistent, they tend to fall in line. Best of luck and many hugs to you, Mama. Thank you, Nadine! I think you’re absolutely right — kids just need a bit of direction, and it always seems to help when we can hand them something like a checklist which they can read and follow step by step. Please let me know how it goes! Okay so im a tween who cleans my own room the only problem is im lazy when it comes to thing like that. Do you have any tips for lazy tweens-teens or lazy people in general when it comes to cleaning? My best advice is to listen to your mother. This checklist for cleaning a kids room is absolutely wonderful! I give it to my daughter every week and her room gets cleaned with no arguments! She even asks for me to print it off if I forget. BTW, she asked me to tell you that the new version is even better than before. Thanks for making my life a little easier! We do the same thing in our house. The kids love knowing exactly what is expected, and it makes everything so much easier! It really does make the whole “clean your room” process less painful for everyone, doesn’t it?